Autoantibodies are the class of antibodies that are produced by the immune system against an individual’s own protein(s). More than 32 million Americans have autoantibodies1. The production of autoantibodies may be due to genetic predisposition, hormones, therapeutic drugs or an environmental component including exposure to viruses and toxic chemicals. The presence of autoantibodies is associated with autoimmune disorders and literature suggests that the use of autoantibodies as a biomarker may enhance the sensitivity and specificity of early detection, diagnosis and monitoring of the progress of autoimmune disorders2-5. 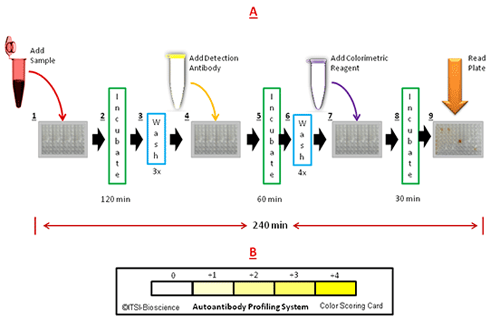 ITSI-Biosciences’ unique Autoantibody Profiling System (iAPS) is specifically developed for rapid identification, discovery and quantitation of multiple autoantibodies that may be present in clinical and experimental specimens. Considering that more than one autoantibody may be present, it is recommended to screen for multiple autoantibodies in each sample to have a better understanding of diseases associated with autoimmune disorders. The profiling system consists of a set of carefully selected and highly purified antigens that detects specific autoantibodies produced by the immune system against one or more of an individual’s own proteins. 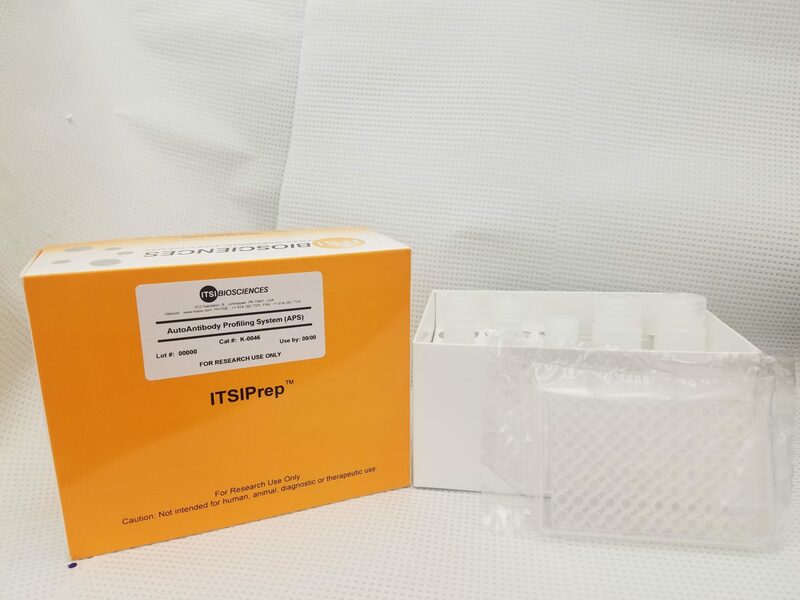 It is presented in a 96-well microtiter plate format and the kit includes all reagents and materials required for screening, detection and interpretation of the results. The manufacturing process utilizes a unique blocking reagent and protocol that ensures high sensitivity and reproducibility. To increase experimental confidence, each plate has an internal standard for the generation of a standard curve, and a positive and a negative control. The product is easy-to-use and no plate reader is required for qualitative and semi-quantitative assays. We have evaluated the performance of the Multiple – Autoantibody Profiling System (Cat No. : K0046.1-90) using plasma from donors with/without ovarian cancer. The kit identified autoantibodies that were differentially abundant in the test and control samples6. 96-well microtiter plate containing probes for autoantibodies and standard curve. The complete probe list is available if required. b) Screen multiple specimens for the presence/absence of a single autoantibody (iAPS-S; Cat No. : K0046.1, K0046.2, etc.). Each kit contains ready-to-use reagents, detection system and a Color Scoring Card. The entire process can be completed in 240 min (Figure 1). Figure 1: Use of ITSI Autoantibody Profiling System involves 9 easy-to-follow steps. All reagents are provided in a ready-to-use format and the entire process can be completed in about 240 min (Panel A). A visible color is generated in positive wells. In the absence of a spectrophotometer the intensity of the color can be estimated with a standardized Color Scoring Card provided with each kit (Panel B). The autoantibody profiling system has been successfully applied to several human specimens, to confirm the presence or absence of autoantibodies. 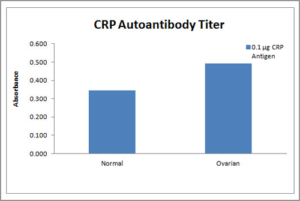 Figure 2 shows the level of autoantibodies against C-reactive protein (CRP) and cardiolipin in plasma from donors with and without ovarian cancer. The Multiple Autoantibody Profiling System has also been used to screen plasma samples from donors with/without ovarian cancer. The kit identified autoantibodies previously reported to be present in cancer suggesting that the kit could be useful as a fast and inexpensive method to rapidly screen specimens for the presence/absence of up to 90 autoantibodies. 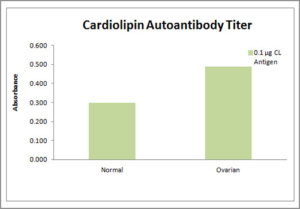 Figure 2: Panel A and B shows elevated levels of autoantibodies against CRP and Cardiolipin detected in plasma from female donors diagnosed with “ovarian cancer compared to “Normal” donors with no history of cancer. The values are the average of two donors per group. Cancer Genomics & Proteomics 13: 13-20 (2016).